Dana Hook likes to use the not-yet-in-the-dictionary word “co-opetition” to describe her business strategy. There’s no doubt she gets top points for being competitive: as the founder and proprietor of Healing Bliss Botanicals, Hook has taken her business from a kitchen-sink hobby to a Comox Valley success story to a specialty brand that is poised to move into major outlets across Canada. Much of this success is based on co-operation. When Hook tells the story of her business, she invokes a broad cast of characters including a Golden Retriever called Jacksun, bee-keepers, lavender-growers and other farmers from the Valley, local retail outlets, her children, the BC small-business training program Community Futures, her fellow vendors at the Comox Valley Farmers’ Market, and pretty much everyone who attended MusicFest in 2006. “The whole idea is to be a community-based business,” says Hook, whose glowing skin and clear eyes could be taken as compelling proof of her products’ effectiveness. The mission of Healing Bliss Botanicals is to “heal the world—one body at a time.” The company produces herbal body, bath and pet products made from natural ingredients, most of them locally-grown or wild-crafted. The ever-growing product line includes 100 per cent natural Rescue Salve, Sore Muscle Rub, Organic Face Lotion, bath and massage oil, lip balm, baby products, pet products and yoga mat sprays. Hook says there’s a burgeoning interest throughout North America in herbal-based, chemical-free skin products. People like how they smell and feel, but even more importantly, they value their purity. “There’s a basic axiom that you shouldn’t put anything on your skin that you wouldn’t put in your mouth,” explains Hook. “Our skin is our largest organ. In fact, we absorb things faster through our skin than through our mouth. Whatever we put on our skin is absorbed into our bodies in 22 seconds. Digestion includes a sophisticated process of filtration, whereas what we put on our skin goes straight to our bloodstream.” Pharmaceutical medicine makes use of this with products such as subdermal hormone therapy and patches for quitting smoking. Mainstream skin and body care products often include a range of chemical additives to create the right texture, color and scent, and to act as preservatives. These all absorb into the bloodstream, potentially causing side-effects and generally adding to the toxic load of the body. “A typical North American is exposed to 18,000 different chemicals every week,” says Hook, 41. “There are chemicals in our air, in our food and water, in our clothes and our couch—all around us. Our body is designed to deal with toxins, but not at the level we are exposed to.” As well, chemical ingredients can cause adverse reactions, sometimes very serious. “People use steroid creams for inflammatory issues on their skin, and they might work for those symptoms, but the steroids wreak havoc on other levels of the body,” Hook says. She points out that the statistics on how many people die annually from pharmaceuticals, even used properly, are shocking. Of course, there are many times when pharmaceutical treatments are appropriate, but she wants to be sure there are more natural alternatives available. It was the desire for a natural, zinc-free alternative for her daughter’s diaper rash that motivated her to start making body products. She couldn’t find what she was looking for, so she decided to make it. This was a new project for Hook, but it was one that was well-qualified to carry out. She had a passionate interest in natural healing dating back more than 15 years and including extensive education and work experience. The story of Hook’s pathway to becoming the successful operator of Healing Bliss Botanicals offers a lively and eventful narrative that could be organized under colorful chapter headings, such as Two Years on a Broken Ankle, What My Dog Taught Me, A Yard Full of Comfrey, The Alchemist Goes to Business School, Cute Boys in the Mist, and more—each chapter describing a key moment that propelled her forward. “I started my journey with herbs and healing through an accident I had,” says Hook, who broke her ankle in 1995. “I received very poor care. I basically got completely overlooked. I had a broken ankle that was not correctly diagnosed—I spent two years walking on it.” Those two years, and the aftermath of damaged alignment, propelled her to learn how to support her own healing. She became a Level I and II certified Reiki practitioner, and studied aromatherapy, Ayurveda, Bach Flower therapy and other healing modalities. Eventually Hook decided to focus on herbal healing and completed a three-year certification program offered by Langara College in 2001. She graduated as a Certified Herbal Practitioner and Consultant. Her next move took her to Portland (following a love interest—now her husband) where she worked in a health food store as the manager of the health department, which gave her valuable experience in retail marketing and taught her about the supplement business. Enter Jacksun, her husband’s Golden Retriever. This itchy, runty, flea-bitten, cataract-ridden and big-hearted dog presented quite a health-care challenge. When Hook took this challenge on, she took the next step in her own evolution as a natural product developer. “I guinea-pigged Jacksun,” explains Hook. This involved a process of experimentation with various products and formulas. The result was something Hook called Jacksun’s Skin Oil. “Poor Jacksun would chew himself raw—he was chewing at himself all the time. When I first rubbed the skin oil all over him, he let out a great big sigh and fell asleep for four solid hours. He never had to use steroids again,” says Hook. Fast-forward a few years and Hook was back in BC, in the Comox Valley, wanting a chemical-free herbal salve for her baby. She found she was able to work from the Jacksun’s Oil formula to develop an product for human use. The resulting cream gradually evolved to become Healing Bliss Rescue Salve, Hook’s most popular product. For a number of years Hook worked as a server at the Atlas Cafe, and in her spare time made salves and creams for her family and friends (and their pets). After the birth of their second child, Hook’s husband made a suggestion that in retrospect seems like a no-brainer—he suggested she attend the Community Futures small-business training program to launch a line of natural body care. But she also loves getting the results of these alchemical processes out in the world, and with this goal in mind she successfully applied for and completed the program, which she says gave her an excellent foundation of business skills. She got started by placing her products at Edible Island and Wagz natural pet product store, both of which she credits with getting Healing Bliss off to a great start. In the way that one good thing leads to another, a couple of fellow vendors from MusicFest suggested to Hook that she set up at the Comox Valley Farmers’ Market. This year marks her eighth season as a Farmers’ Market stalwart and she is full of enthusiasm for the many ways this venue has boosted her business. “I’d say the number one thing I appreciate is how much my business has grown because of the market. Part of this is that I’m there to represent myself. It’s been so great to become a solid member of that community,” she says. Another benefit is certainly the impact on sales. “Every year my sales and customer base at the Market increases 50 to 100 per cent. And another fantastic thing about the Market is that I get a lot of what seems like random website orders from all over the place—the Yukon, Finland, Germany, places where I don’t know anyone. When I ask how they found me, often it’s because they visited Courtenay and discovered me at the Market. Sourcing products locally helps Hook ensure that her ingredients are fresh and pure. It also keeps her carbon footprint low and connects her business to a network of local community relationships, which fits with her core values. She also grows and wild-crafts many of her materials. She chose her South Courtenay house, she says, partly because it had a yard full of comfrey, and she makes trips to various spots around the Valley to harvest plantain, chickweed and nettles. The steady growth of the business means constant change for Hook. At one point it became clear that making products in her kitchen was no longer sustainable, so she renovated her garage and partnered with a local soap maker to share premises. She’s now looking into renting space at a professional facility with a Good Manufacturing Practice certification. This spring, for the first time, she’s hired two staff members to help with production and Farmers’ Market sales. Earlier this year she engaged a distributor who has helped get her products into outlets further afield such as John’s Independent Grocer in Saskatchewan. This meant changing all her labels so that they include French. She is also planning for an upcoming meeting in Vancouver with a representative from the grocery chain Whole Foods. If this goes well, it would give her a giant step forward. As with every step forward, this one won’t happen without hard work. Along with all this, Hook still manages to find time for product development. “I’m coming out with a dog shampoo and a head-to-toe baby wash. My sunblock is my next product. My goals were that it won’t turn your skin white, it won’t be sticky, and of course it will protect you from the sun. There’s a 15 SPF, a 30 and a 45. And my deodorant just came out in April and has had really great reviews on Facebook. It doesn’t sound like Hook is going to be stopping either. Clearly, co-opetition is working well for her. It is a glorious weekday afternoon and all is quiet in the Wildwood Forest, northeast of Courtenay. The sun is streaming through the canopy of majestic fir trees and a slight breeze tickles their branches. The sunshine and shadows dapple the fern-covered forest floor, and it almost seems to sparkle. It is the perfect day for a trail ride. Sharon Pickthorne pulls up with her truck and horse trailer. Her horse, Elsa, nickers a welcoming greeting to the other horses and riders waiting there. They are all members of the North Vancouver Island (NVI) Chapter of the Back Country Horsemen Society of British Columbia (BCHBC). Soon, the sound of laughter and the crunch of horses’ hooves on gravel breaks the stillness as the equine entourage sets off for a ride through the woods. A few kilometres away, at the BCHBC hitching rail near the corner of Condensory and Burns Roads, Rick Phye and his wife, Audrey Phye-McKenzie, drive their rig into a special horse trailer parking area. It provides quick and easy access to the historic One Spot Trail. They unload their mounts and are soon enjoying themselves on the well-maintained and scenic eight-kilometre-long trail. The 70 plus members of the BCHBC-NVI are grateful that they have the privilege of riding in these (and other) parks and green spaces within the Comox Valley Regional District (CVRD). Unfortunately, due to increasing insurance risks for both private and corporate landowners, related to development, logging, and recreational use, many privately-owned forested areas on Vancouver Island are being closed to equestrians and other outdoor enthusiasts. And that’s where the BCHBC comes in. They are true champions of multi-use recreational trails and they work hard to ensure their future ‘right to access’. Their efforts not only benefit equestrians but cyclists, hikers, runners, geocachers and ordinary people who just want to get out and enjoy nature while walking their dogs. Rick Phye was instrumental in the creation of the Salmon Brewster Equine Campsites and Trail Corridor Project—two horse campsites and a trail network in Sayward. Pickthorne, who is chair of the NVI Chapter, can list dozens of examples on Vancouver Island and across the province where BCHBC’s communication and collaboration with local governments have opened new opportunities for outdoor recreation user groups. NVI is one of 22 chapters of the non-profit organization that has almost 800 members province-wide. Here in the Comox Valley, for example, BCHBC-NVI works closely with the CVRD, Recreation Sites and Trails BC, private landowners, forestry companies, and other community stakeholders. “Our engagement with the CVRD started with the historic One Spot Trail project in the Comox Valley in 2008/2009,” explains Pickthorne. “Our organization was entrusted to develop one-third of the One Spot Trail, under the CVRD’s strict engineering and environmental requirements, of course. We submitted a budget, sourced the materials and equipment, and then supplied the volunteer labor to complete the project. The pay-off for trail riders? “The CVRD has been extremely generous in providing equestrians better and safer access to local trails, even going so far as to install horse trailer parking, outhouses, and hitching rails in some parks,” says Pickthorne. “In gratitude, we use the proceeds from our fundraising efforts for trail enhancements within the District. Over the years, BCHBC-NVI has not only provided the CVRD with a steady, reliable ‘go-to’ organization of volunteers, its members are often asked for their input to help make decisions about horses on all trails through the regional park system. They’ve collaborated on everything from building bridges, to decisions about the best footing for trail surfaces, horse trailer parking, signage, safety, trail hazards and more. Members of the organization were consulted on the creation of signage for the Royston to Cumberland Trail, to help identify hazards and trail conditions of special interest to equestrians. They were also considered in the development of the 20-year master plan for Seal Bay Park. With input from BCHBC and other park users, the CVRD is starting consultations for the Seal Bay Park management plan update this summer and will be conducting user surveys at the park. There will be an information tent and copies of the park user surveys at the Bates Road parking lot on Sunday, July 19 from 9:30 am to noon and on Tuesday, August 11, from 2:00-4:30 pm. If folks miss the opportunity to review the plan at the park, the CVRD will have an online survey on their webpage in the fall and they will hold an initial public and stakeholder meeting. “BCHBC members have been great in helping with new projects, as well as on-going maintenance with brushing and clearing of trails,” says CVRD Parks Technician Brian Allaert. “Their contribution of time ensures that we get projects done sooner. Their input in the design process ensures that we get it right the first time, with horse and rider safety being considered. While BCHBC members enjoy the privilege of horseback riding on the local trails maintained by the CVRD, they also think nothing of loading their equine companions into horse trailers and traveling long distances to explore the wilderness on horseback. That is why, in 2010, Rick Phye decided to talk to them about his dream of building two horse camps and a 40-kilometre trail network about 100-kilometres north of here, in the Sayward Valley. Phye, a retired logger and cattle rancher, and Gerald Whalley, a retired forestry worker and the current Director for Kyuquot-Nootka/Sayward (Area A), met many years ago. Through their mutual love of horses and the backcountry, the two men became good friends. They enjoy trail riding anywhere together, but especially so in the rugged and beautiful Sayward Valley. Over the years, they have logged countless hours together on horseback, moving cattle on the Salmon-Memekay Grazing Lease, mending fences, blazing new trails, and dreaming. One weekend in the spring of 2010, Phye decided to head up to Sayward, to ride and camp at the then undeveloped Memekay Grazing Lease. He invited a long-time backcountry trail riding enthusiast and member of the BCHBC along for the adventure. “When we were out riding, I suggested that we stop to take in the scenery,” recalls Phye. “We pulled up our horses at the Salmon River and there was an overwhelming sense of calm. We both felt truly blessed to be riding in this special place, owned by the Crown, meaning that it is actually owned by the people of British Columbia. Phye was more than happy to leave the paperwork to a handful of BCHBC volunteers, as they drafted a project proposal to present to their membership. Enthused by a compelling PowerPoint presentation and a Google Earth tour, they voted to support the project and, as the saying goes, the rest is history. The confidence and experience that they had gained by working with the regional government gave the BCHBC members the confidence to commit to Phye’s grand campsite dream and turn it into reality. It has been the most ambitious development ever undertaken by the group to date. In addition to all of the other trail development projects they continued to work on, from 2010 through 2013, NVI chapter members put in 1,100 hours of volunteer effort and secured financial support totaling $149,000 in donations, grants, and gifts ‘in kind’ for the project. The camps were officially opened in July 2013 and BCHBC-NVI is committed to continue to maintain them in the future. The Memekay Campsite that the volunteers designed and constructed features 11 campsites with ample room to pull in RVs and horse trailers, with two horse corrals at each site. There is also a group shelter with picnic tables and a stove. The Brewster Lake site has no designated camping spots but plenty of room for rigs, plus two large horse corrals. Both campsites are completely ‘off the grid’, with no running water, electricity or cell phone service. (There are outhouses.) The two camps are connected by a 31-kilometre long trail. In early January 2015, BCHBC-NVI received word from Duncan Mactavish, District Recreation Officer, Discovery Coast Recreation District, Ministry of Forests, Lands and Natural Resource Operations that the two horse camps and the 40-kilometres trail network had been officially designated under Section 56 of the Forest and Range Practices Act. The facilities are now legally established by Recreation Sites and Trails BC, and the Ministry, to be protected and enjoyed in perpetuity, for generations to come. That dream has been captured in written form as well. Trail Blazers: The Creation of the Salmon Brewster Equine Campsites & Trail Corridor Project is a local story that celebrates a love of horses and the wilderness, and of friendship, laughter, perseverance, volunteer spirit, community collaboration, and backcountry grit. The book chronicles the creation of the Salmon Brewster Equine Campsites and Trail Corridor Project and how the BCHBC-NVI Chapter worked with local community stakeholders to see the project from concept to completion. It also provides a question and answer chapter, to help people plan their camping trips to the remote site. Proceeds from the sale of the book will help fund ongoing maintenance and development of the campsites and trails. To purchase a copy of Trail Blazers visit Laughing Oyster Books or South Country Feed & Supply, or call Terri at 250-218-4952. Established in 1989, BCHBC focuses on safety for horses and riders, environmental stewardship, trail building and maintenance and fun. The NVI chapter meets once a month at Grantham Hall. 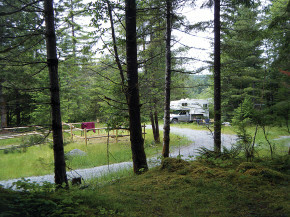 For more information on the Salmon Brewster Equine Campsites and Trail Corridor Project, visit http://goo.gl/aXZcE5. For information on BCHBC-NVI membership, call Sharon Pickthorne at 250-337-1818.